We’ve made sweet Italian sausage even better by making it antibiotic-free. 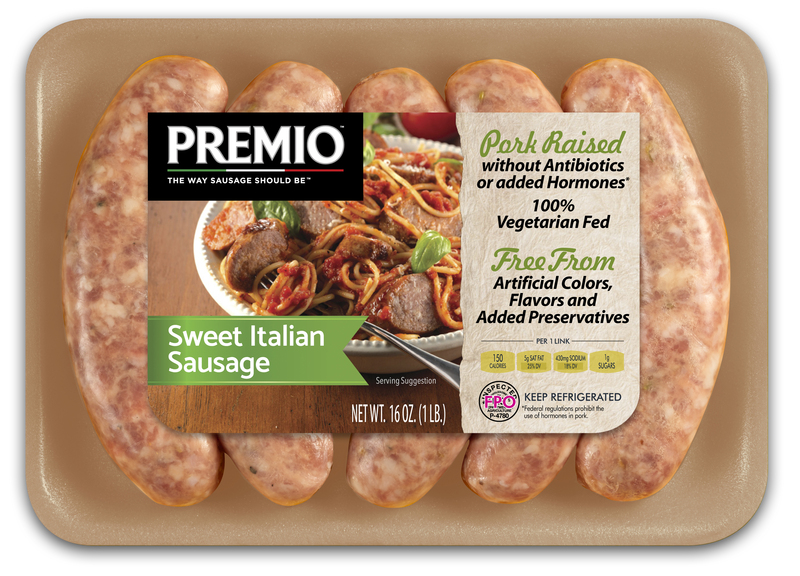 Premio Sweet Italian ABF Sausage packs plenty of taste into every bite. Looking for the ultimate game-day snack? Use Premio Sweet Italian ABF Sausage to make a sausage ring, a dip, some mini sandwiches or bruschetta. Just be sure you make enough because everyone will come back for more when you use our Sweet Italian ABF Sausage. Ingredients: Pork, Less than 2% of the following: Water, Salt, Sugar, Spices (including fennel & black pepper), Potassium Chloride, Paprika, Natural Flavors. Sweet and sassy, our Italian ABF sausage has just the right blend of spices to keep you coming back for seconds. Each bite of this juicy bestseller lets you know exactly why Premio Foods is the premium supplier of top-quality sausage products. For four decades, our sausage has stood the test of time. True sausage aficionados wouldn’t dream of using any other kind of sausage for their recipes. Find out for yourself what all the hubbub is about. Purchase a package of sweet Italian ABF sausage at your nearest vendor today. Have you found yourself in a protein “rut?” Do you use the same meats and protein products again and again? Is your family almost ready to start a revolt against boring meals? It’s time for you to turn to the power of sausage. Many cooks have discovered just how valuable adding sweet Italian ABF sausage links to their meals can be. Sausage adds a new taste element to every dish, changing the flavor and making even old standbys seem new and fresh again. Why Eat a Dull Breakfast When Sausage Is Available? Tired of the kids slogging through another bowl of cereal? Warm up your morning meal plans with sweet Italian ABF sausage links. They go beautifully with all types of sides, including eggs and pancakes. Don’t forget the real maple syrup, which makes a nice dip for pieces of our sweet Italian sausage! Why top your salads with the same-old items? Grill or cook some pieces of sausage and top your salads with them. Sausage pairs well with all types of veggies and fruits. Have a garden? Add sausage to your tender greens, robust tomatoes and crispy cucumbers. Play around with different dressings for truly unique flavors that will make salads burst with a wonderful aroma and flavor. In the cooler months, soups and stews are regularly on the menu. Dish up something wonderful by adding diced bits of our ABF Italian sweet sausage. It goes particularly well with creamy potato soups, as well as your grandmother’s prize-winning chili. Don’t forget you can turn vegetarian-based stews into a protein-fueled meal with a little sausage.